Not only is this a great condom but its easy to carry in the wallet. The Pull tabs are confusing at first but after the first time they are a cinch to put on – even faster than putting on latex. I found these condoms in Brasil some years ago and could not find them when I moved to the states. So happy I found them. They have improved the Pull tabs. The best condom I have every used. I thought it was broken because I could not see it but I kept checking and it was still there. You literally cant feel the condom. Love the package. 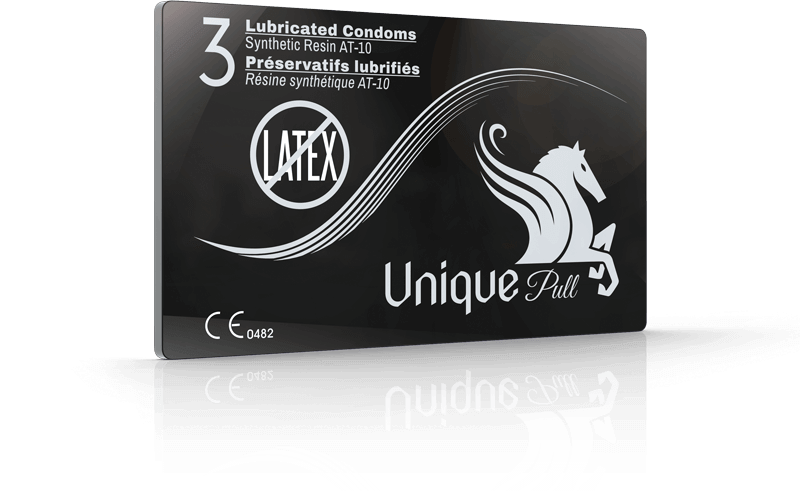 Experience more pleasure and higher sensitivity with Unique Pull for medium to large size men. Unique condoms are vegan and odorless. They are 3 times stronger and thinner than latex. Includes: 3 lubricated latex-free condoms in a credit card sized package. Sizing: For medium to large size men. See options for large size men and narrow girth men. Free shipping when you buy 5 or more products. Shipments go Standard Postal Service and may take 5-7 business days. Holiday season delivery times may be longer. Excuse the possible delays. All orders shipped in unbranded packaging.